Led by SJU faculty, Saint Joseph’s Rome Summer Program takes place at the American University of Rome in Trastevere. While taking an intensive language course, students participate in cultural activities, on-site lessons and excursions to Florence, Siena, Assisi, Capri, Pompeii and Sorrento. For information on the current summer program click here (Center for International Programs) and here (PDF Flyer). Our study tours are designed for students who want to experience the culture and heritage of Italy but who can only allot approximately fifteen days for travel during the summer. Students will attend 8 to 10 classes on campus in preparation for the study tour. These classes serve as an introduction to the history, the geography, the art and the literature of Italy and on the special topics addressed during the tour. For more information on study tours, click here. For further information on all study abroad programs in Italy, contact the Center for International Programs, or Dr. Paola Giuli. 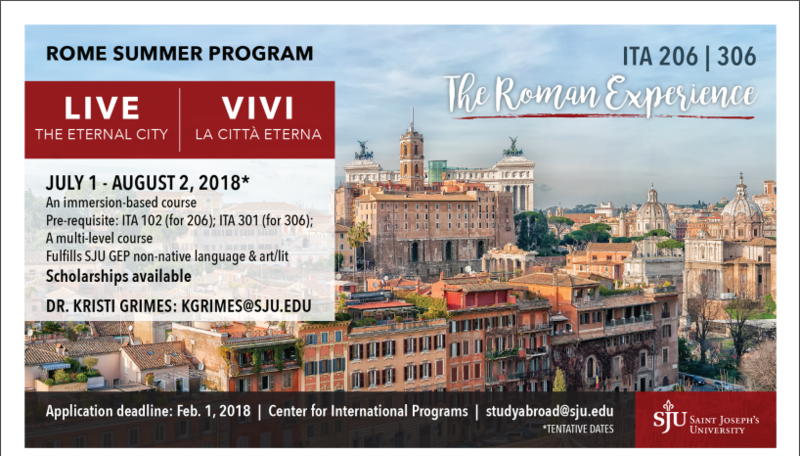 The Italian program, in cooperation with the International studies Program, offers several opportunities for study experiences in Italy that will truly be memorable. In order for your courses to count for Italian credit, it is important that you have them approved by Dr. Giuli and by the MCL chair before you leave. Students may study at approved universities in Florence, Rome and Milan. In Florence students can take courses at Fairfield University and at Gonzaga University. In Rome students can take courses at the centrally located American University of Rome and at John Cabot University. In Milan, students may attend the Universita Cattolica del Sacro Cuore. Students are typically housed in apartments in neighborhoods nearby the campus. A variety of courses are offered in Italian language, literature and culture at all levels, courses fulfilling GEP requirements, and courses in English, the arts & sciences, as well as business.